The Health Care Tattoos database contains tattoo ideas which have been vetted by a paramedic for medical accuracy. Don't ink something onto your body forever without first knowing for certain what it means. Browse this site for tattoo ideas, and submit photos of your medical tattoos for the benefit of others to healthcaretattoos@gmail.com. This is an interesting tattoo for a nurse. The two EKG complexes are accurate, with a slight degree of imperfection (the S wave in particular) that might appear in a real life rhythm strip. Be cautious not to let your QRS complex run together. 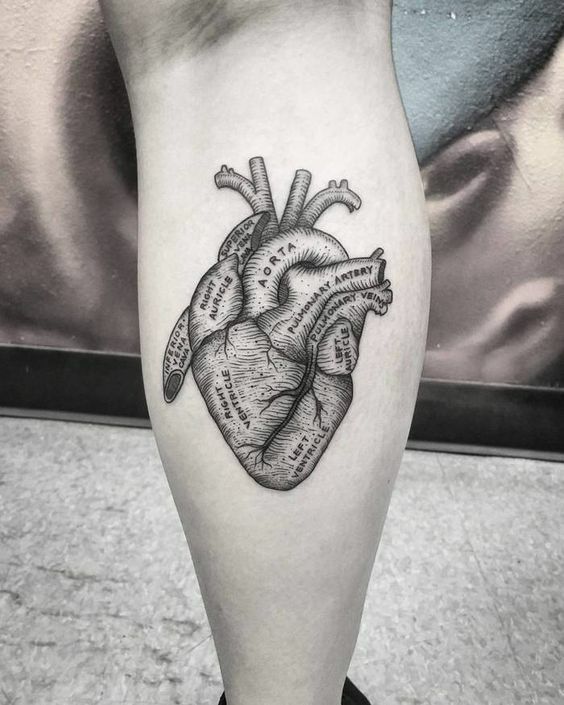 This tattoo features an anatomical heart with Gray's Anatomy style labeling. All parts appear to be in their proper location. FYI auricle is a descriptor for a piece of anatomy which has an appearance of an ear, and is another term for the atria of the heart. Wow! I really like this one. The top photo accurately shows what appears to be a Mobitz type I "Wenckebach" heart block (note the skipped heart beat right in the middle of the tattoo). The bottom photo accurately shows the three views from a 12-lead EKG that reveal a ST segment Elevation Myocardial Infarction (STEMI), also known as a heart attack. And from the look of it, it was a big one. I couldn't find the original website where this came from, but my guess is the owner of this tattoo is a heart attack survivor. I've always liked this one. 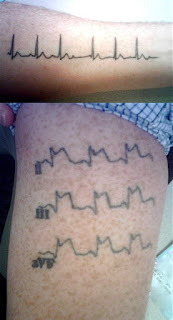 This tattoo shows a normal sinus rhythm with realistic graph paper lines. Although the spacing of the graph paper lines seems to be mildly disproportionate, the EKG rhythm itself looks great. My sincerest gratitude to L.D. for allowing me to post this photo of his tattoo, and my apologies for not getting to it sooner. 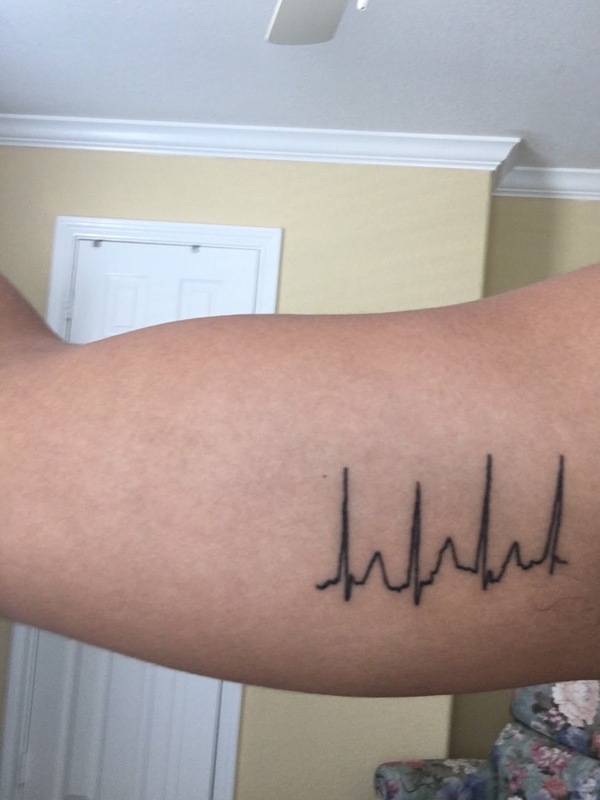 This is a tattoo tracing of a real life EKG complete with a little bit of artifact (minor electrical interference) which is very common and expected in actual cardiac monitoring. 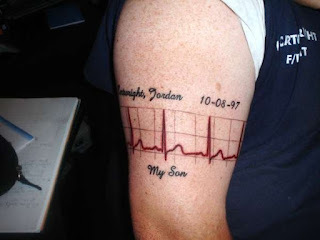 A person wanting a reality feel to their tattoo should consider obtaining an actual EKG under less than ideal conditions (sit upright in a running or moving ambulance perhaps?) and incorporating some of the minor imperfections they find. One word of caution is to be careful of how tall the QRS complexes are. That's the skinny, spiky part jutting upright the highest from the baseline. If this gets too tall it could indicate Left Ventricular Hypertrophy. If in doubt, email me for a free consultation. My summer activities and winter preps have wound down in intensity and volume, and I should be able to get back to you fairly promptly. Thank you L.D. for sharing your tattoo photo for the benefit of others! This was the result of an EKG consult request email, which I think came out really well. The goal was to incorporate some aspect of the ocean in the waveform, and the requester came up with the brilliant idea to turn the T wave into a sea wave. After a bit of trimming and adjusting the tattoo was complete. 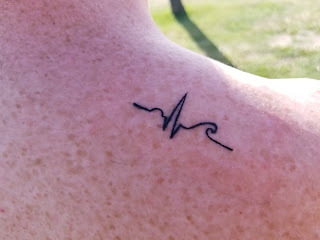 ***IMPORTANT NOTICE: The person who received this tattoo intended to adjust the T wave to appear like an ocean wave. The T wave is the final shape in the heartbeat (which in this case obviously looks like a wave of water). If you desire a normal EKG waveform without coastal imagery, this is still a fine place to start. Check out part I of my EKG primer for more information on the normal sinus rhythm. Thank you E.W. for allowing me to post this tattoo. This tattoo is of a very simple and elegant EKG showing one sinus heartbeat. All waves look appropriately sized and are aesthetically pleasing. 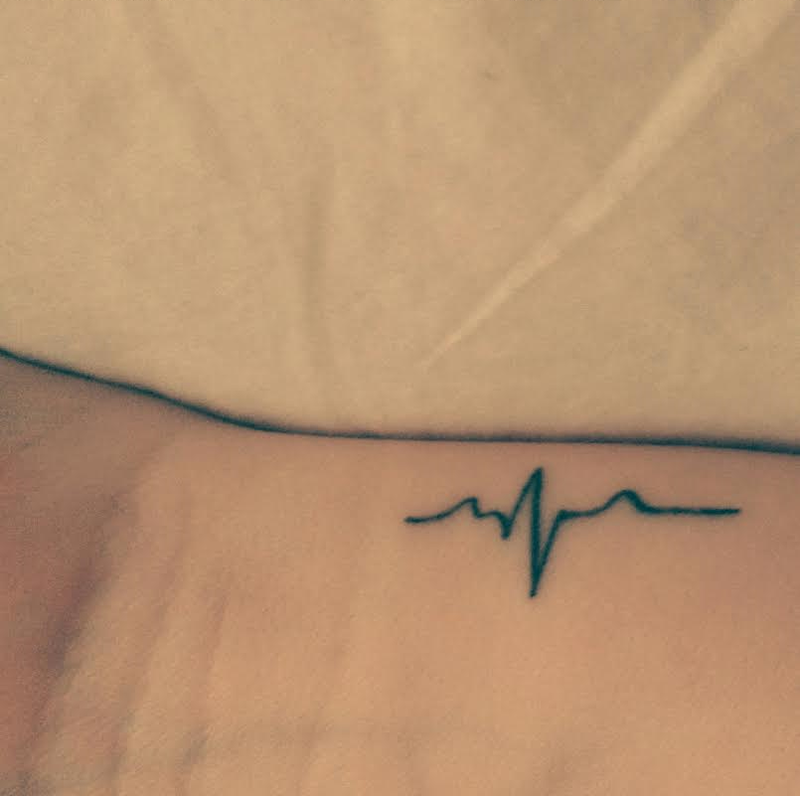 Tips: The QRS (the sideways Z shaped wave in the middle of the tattoo) must be kept as narrow as possible to avoid giving the appearance of a damaged heart muscle. I am told this can be difficult to accomplish without the ink running. Make sure you have a conversation with your artist about keeping the QRS complex as narrow as possible. 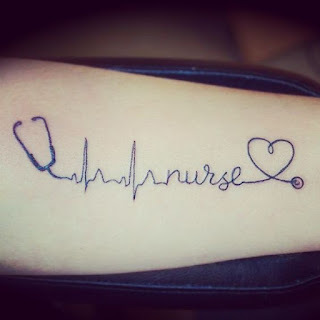 For free health care tattoo consulting, or to submit photos of your own tattoos to be displayed on this site for the benefit of others searching for tattoo ideas, email healthcaretattoos@gmail.com. 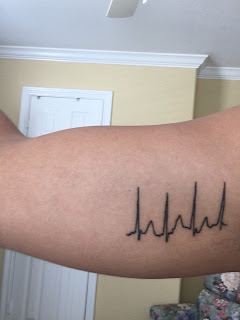 Which part of my 12-lead EKG should I use for my tattoo?